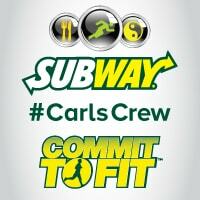 Wow, it’s hard to believe it’s already Week 6 on the SUBWAY Canada Commit to Fit Challenge! Last week, Carl Savard, the SUBWAY Canada Commit to Fit Ambassador challenged us to keep a food journal. I’ve attempted these in the past and always gave up a few days in. I just forgot to write down what I was eating. This time around, I kept the journal and a pen in the kitchen and jotted down what I ate. I just used a pad of paper and a pen, but I found some cute free food journal printables to download. I’d like to print out a bunch and make a binder. I’ve had a lot going on personally and have been stressed out. When I’m stressed, I have to force myself to eat. On the plus side, I’ve lost weight. I notice that I am making healthier choices now. I snack on oranges and apples when I’m craving something sweet. I also am eating a lot more salads. I ate a salad almost every day according to my journal. Here’s a list of a few free printable food journals I found online. I think food journals help keep you accountable and also allow you to see if there is a pattern to your eating habits and cravings. I know that I tend to be hungrier at night and hardly ever feel hungry in the mornings. Do you currently keep a food journal? Have you ever used one in the past? Check out my previous challenge posts for Week 1, Week 2, Week 3 and Week 4. No I don’t keep a food journal! I don’t keep a journal but, I should. This is my husband’s favorite restaurant. Since I found out I have Diabetes type 2, I’ve been keeping a food journal. I don’t but probably should. No I don’t, I did years ago…it can be very illuminating. I don’t, but probably should. I do not but I really should! I don’t keep a food journal. No, I don’t keep a journal. I dont but, it would be interesting to do so! No I don’t but it is a great idea. I do not keep a food journal now…but I use to years ago. No, I do not keep a food journal. No doubt it would be a good thing to do. I just started to keep one this past week. It really helps keep track of things! Yes I do – it helps keep me in check! No I dont keep one. No, I do not keep a food journal. But I am very conscious about what I am eating on a daily basis. I don’t keep a food journal. However I do try to keep track in my mind on what sweets and healthy foods I have eaten during the day and try to keep it balanced. I do not and have never tried for me. Did when my DD first switched to solids.